rvm requirement used to print a list showing you what libs you need (at least as of in 2013 February). Now ( 2013-05-29 ), it start to install software without warning. Google Search is getting stupid. After 10 min, i can't find no info. Then, i went to https://duckduckgo.com/ search. Searching for “rvm requirements change”, and indeed, first result is https://groups.google.com/group/rubyversionmanager/browse_thread/thread/051b3c85e544efc4. It's a rvm forum, and another guy made the same complaint about the undocumented change of “rvm requirements”. I actually spend a hour or two on this. For the record, am using rvm 1.20.12. The installation of rvm is also pretty weird. That means, it uses curl to fetch a script, then simply run bash on it. That URL, actually redirect to 〔https://raw.github.com/wayneeseguin/rvm/master/binscripts/rvm-installer〕, another weirdness. Also, note the syntax \curl, which is a esoteric mechanism in bash that prevents it running a alias with the same name. All these is pretty weird. If user really have set alias to curl, then we assume he really do, maybe he's got some setup of curl or other reasons. And also, why curl and not wget? wget is by default installed, curl is not. And, why the redirect? Why not put the real path? And, it's strange to grab a script online and feed it directly to bash. It'd be simpler and normal to tell user to wget a url, then run that as installation script. Also, there's standard debian package. Also, note the installation page, typical of unix man pages, exceedingly unnecessarily complex. It lists various things all together in one place. It'd be simpler, to tell user of separate steps. For example, one page on just installing rvm. 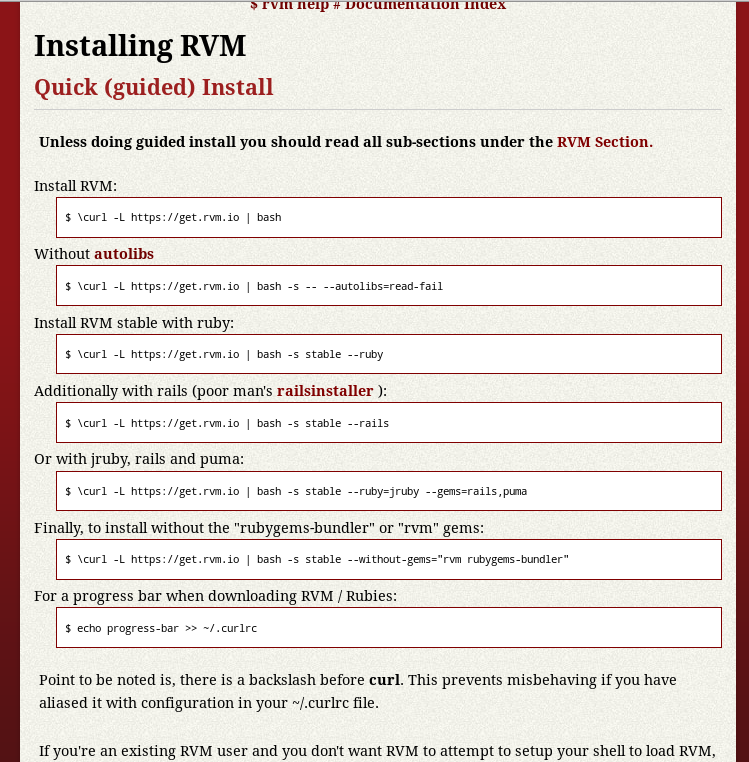 Then, a separate page on how to use rvm to install ruby, rail, or other libs. Now, if you do man rvm or rvm --help, you'll see it's very complex. Just rvm itself, no ruby, has 199 dirs, 742 files. See: Ruby: RVM Directory Structure. Adding rvm PATH line to /home/xah/.bashrc /home/xah/.zshrc. Adding rvm loading line to /home/xah/.bash_profile /home/xah/.zprofile. I can't say there's anything wrong with it exactly, but everything about rvm is just a bit weird. really dislike rvm. One HUGE, COMPLEX, set of bash scripts. Yes, bash shell scripts, in the year of our lord 2013. The choice of bash couldn't possibly be ease/compatibilities/portability issue, because it does requires certain later version of Bash, and not Bourn Shell, and it uses advanced features of bash. Perl has been default install on Linuxes and Mac OS X for many many years. Default Perl would be much more powerful and flexible than bash. Or, they could've relied on a universal version of Ruby such as version 1.8 or earlier. After all, rvm is about Ruby. Though, it seems rvm is nevertheless robust. Its authors know bash and unix system really well. rvm is created by Wayne E Seguin and Michal Papis. Also, although i find rvm distasteful, but one of its author, Michal Papis, has been very helpful. In 2013 February, i randomly bitched about rvm on twitter, and he helped me solve the problem.